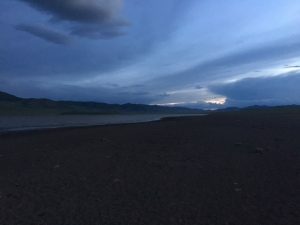 Throughout Mongolia the skies have been gorgeous. I have twice woken up in the night and made myself get out of the tent to stare at the stars and the full moon rather than just turning over and going back to sleep. It has definitely been worth it as they are not skies that we will see over Hong Kong, Tokyo or London. Only the Pitcairn Islands, the Falklands, Svalbard and Jan Mayen in Norway and Greenland have a lower population density than Mongolia so the air is crisp and clean and the skies are extremely clear. We have also been climbing during the day and we are now camping at 2200m so there is a distinct chill in the air. Reading the ERA daily reports on the rally I would point out that for us at least the watching of local birdlife and the smelling of herbs wafting on the breeze is replaced while driving by staring 20 metres down the road for the next rock and the inhalation of about 2 kilos of dust a day so the 4am star gazing is perfect. We are driving with the windows open as we thought AC was probably a luxury we should do without, so the dust is unbelievable. At one point on a timed section we were hit by a side draught just while on a particularly dusty section of track and the inside of the car turned into a snow-globe!